Hagley Museum and Library opens up its 235-acre site along the Brandywine for biking, hiking, walking, and picnicking Wednesday evenings in July and August. "Each evening of Bike and Hike, we will have crafts or games for families to enjoy," says Museum Educator Ruth Lonvick. "We have also invited community organizations to add even more fun to the evenings." When the summer sun starts heating up, cool down at Hagley Museum and Library during Bike and Hike, every Wednesday evening, 5 to 8 p.m., in July and August. 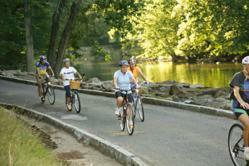 Our 235-acre riverside landscape offers a shady retreat for walkers, hikers, and bikers. Admission is $2 per person and free for members. Dates are July 3, 10, 17, 24, 31 and August 7, 14, 21, and 28. Wander along the most beautiful mile on the Brandywine or through wooded trails above the powder yard. During Bike and Hike, visitors will have access to the entire three-mile loop from the Visitor Center to Eleutherian Mills, the du Pont ancestral home. Bring your family! Hagley’s 235-acre property is open to walkers and bikers but closed to traffic so it is an ideal spot for kids biking with training wheels and riding in strollers. Throughout the season there will be fun family activities like scavenger hunts, leaf rubbings, and other nature-related activities. Hagley will also host other local community organizations that will provide education and fun for families: Urban Bike Project on July 10 and August 21, Delaware Bicycle Council on July 17, and Woodside Creamery on July 24. Picnic in one of our wooded areas or enjoy dinner on the porch of the Belin House Organic Café. The Belin House Organic Café is located on Workers’ Hill approximately half a mile from the Visitor Center. The café features seasonal menus that include simple, prepared items made from farm-fresh, locally-grown, organic ingredients. Worried about the weather? New this year are rain dates for Bike and Hike. The rain dates are every Thursday in July and August (excluding July 4): July 11, 18, 25 and August 1, 8, 15, 22, and 29. Weather postponement decisions will be made by 3 p.m. and will be posted at http://www.hagley.org. Hagley Museum and Library collects, preserves, and interprets the unfolding history of American enterprise. Hagley is located on Route 141 in Wilmington, Delaware. GPS Address: 200 Hagley Road. For more information, call (302) 658-2400 weekdays or visit http://www.hagley.org.